The Arbor Gate has a few new products to help with Flood Cleanup! 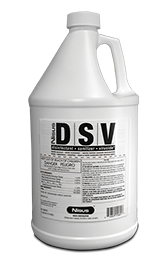 DSV is a disinfectant, sanitizer, virucide, anti-mildew, fungicide, and deodorizer all in one concentrated solution. This powerful disinfectant that is highly effective against disease-causing bacteria. But it’s also a sanitizer that can rid an area of germs and fungi that can cause sickness and mold. And it’s a powerful virucide, capable of killing the viruses you’ve read about in today’s headlines, as well as many others that you may not even be aware of. It prevents and eliminates mold, mildew and fungi. It also will kill small nuisance and drain flies, including Drosophila flies. One gallon of concentrate will make 64 gallons of solution. BAC-A-ZAP is formulated to provide powerful odor elimination with a pleasant new scent. 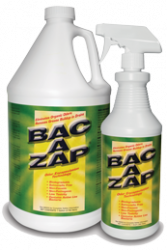 BAC-A-ZAP has a special blend of seven microbe strains that consume organic materials that cause odors. So for dumpsters, dead rodents, animal odors, urine, feces, vomit – even skunk – BAC-A-ZAP will get the job done! It’s also great for foaming into drains to keep commercial kitchens operating at peak performance. It doesn’t just knock odors down. It eliminates them! BAC-A-ZAP ia also great for pets and other animals. Urine, feces and vomit smells can be eliminated from carpet upholstery and mattresses. Use BAC-A-ZAP on farms to minimize odors in dairy barns, chicken coops and pig pens. BAC-A-ZAP is also great as a wash-down for stalls and floors and perfect to keep drains clear. Stop in today to pick up both of these products!